A number of last year’s top juniors from Romania were recently promoted to the so-called “Olympic team” at Deva. The list includes the three girls I included in my choices for top three of Romanian juniors in my Up-and-Coming Juniors series. Romanian head coach Nicolae Forminte says that their overall scores need to be raised by 5-8 points (they all typically score in the mid-50 range right now). 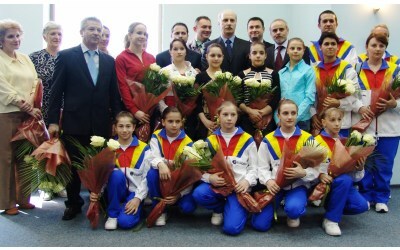 Gymnasts coming from Cetate Deva include Raluca Haidu, Amelia Racea, Loredana Sabau, Diana Trenca and Claudia Voicu. The only two “outsiders” are Diana Chelaru coming from Onesti, and Ana Porgras from LPS Galati. Racea, who placed fourth at Europeans this year and took the Category II (1993-1995 births) title in Romania last year, is among those who won’t even be eligible for senior competition next year. Trenca was second to Racea in Category II. Chelaru, Porgras and Sabau placed first, second and third at the Category I championships last year. Sabau and Porgras were also both at Europeans, where they placed sixth and ninth, respectively. I don’t know much about Haidu, but she was fifth in Category II last year. Voicu, if I remember correctly, was not at the 2007 AA nationals, but took first on bars and beam and third on vault in the June 2008 event final nationals. She was also 18th in the AA at Europeans last year. The main problems these gymnasts are having are, unsurprisingly, on bars and vault — bars because they’re Romanian, vault because they’re juniors. I think having them train with more experienced athletes is probably a good move on the part of Forminte, who I’m sure wants a much more solid and deeper team for the next quad.